← What is ECP Inbox and why is it on all my ios devices? Who Doesn’t Love Getting Work Done a Without Lifting a Finger? I do and I’m willing to bet that other close members of my family do too! But there’s one specific family member that I have in mind for today’s tip. I’ll let that person figure out exactly who I’m referring too :-) So, while this handy ‘Tip of the Day’ is really intended to be for that one special person, because I know that sharing is central to who they are I decided that they’d appreciate my sharing this with our larger ‘family & friends universe’ which, by default means sharing it with the whole world too! 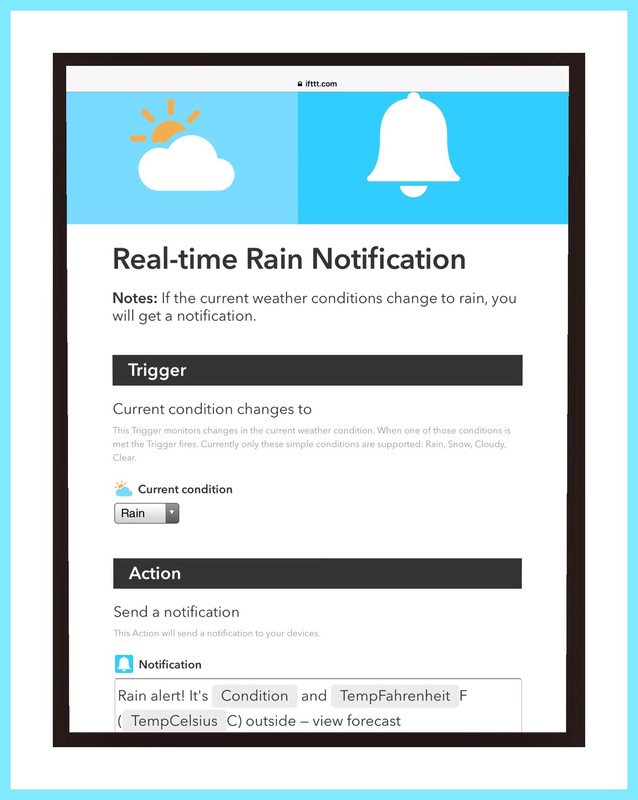 IFTTT can notify me when it will rain. IFTTT is a free web-based service that allows users to create chains of simple conditional statements, called “recipes“, which are triggered based on changes to other web services such as Gmail, Facebook, Instagram, and Pinterest. 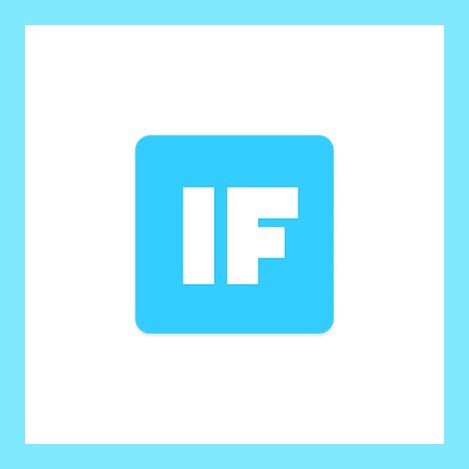 IFTTT is an abbreviation of “If This Then That”. Channels are the “basic building blocks of IFTTT”, they mainly describe a series of data from a certain web service such as YouTube or eBay. It can also describe some actions controlled with certain APIs like SMS. Sometimes, it can represent information in terms of weather or stocks. There are particular triggers and actions in each channel. Recipes are the predicates made from Triggers and Actions. For example, if you like any picture in Instagram (trigger), the photo will be sent to your Dropbox account (action). Ingredients are basic data made available from a trigger. For example, the data that are available from the email trigger include subject, body, attachment, received date, and the sender’s address. Using IFTTT is Much Easier Than Reading It’s Definition! That’s because there are a lot of tech-gifted geniuses out there who’ve figured out all the techie stuff for us. They, along with the IFTTT engine, have gone to all the trouble of making their IFTTT tricks very simple for us normal-folk. 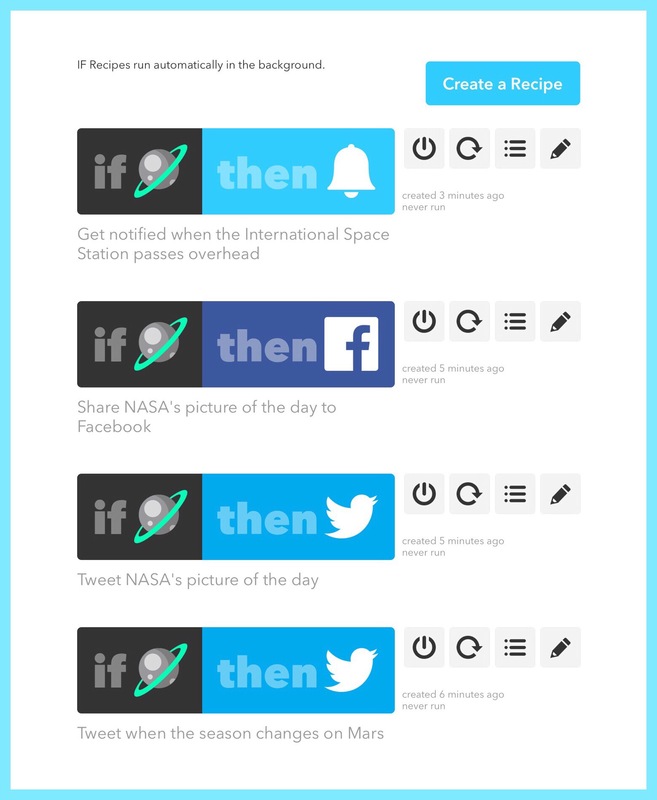 Using IFTTT is as simple as creating an account here. Then connecting up a few of your web-based accounts such as Gmail, Evernote, Twitter or Facebook, by signing into your accounts while on your account page at the IFTTT website. Then, searching for cool things to do with it. Those cool things are actually the recipes. The web-based services themselves are called channels. So the best way to find things is to search by channel. Let’s say you have a Gmail account. You can search the Gmail channel to see all the recipes that other people have created for it. Once you find one you like, you just select it by either tapping or clicking on it, and IFTTT will automatically guide you through a few simple steps to get it working for you. When your done you’re presented with a Done message along with a Recipe ID #. But really, you don’t even need to record that number or do anything else…because it’s all so simple. The only thing that you’ll need to remember to do is to record your user account sign-on information…basically your email account name and your user password. 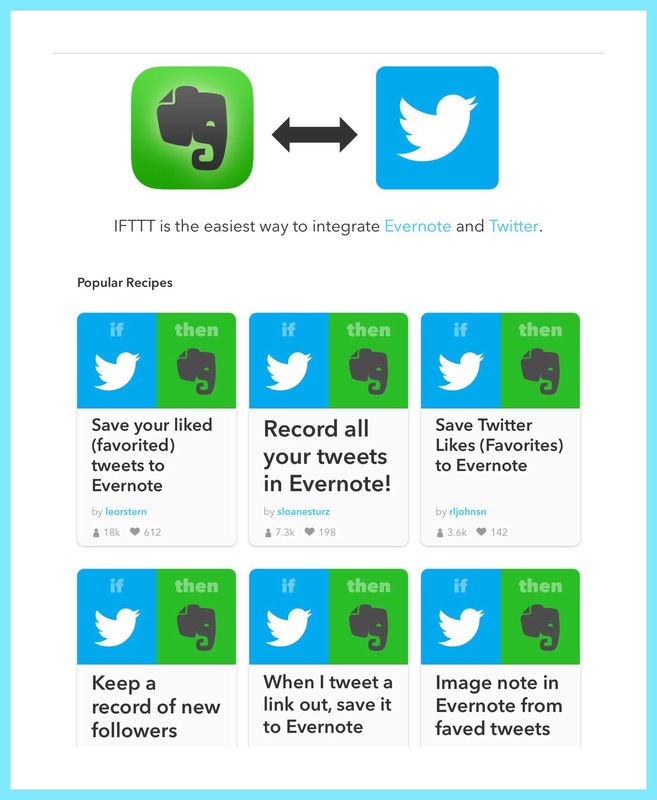 I love using IFTTT to keep track of things for me in Evernote. One way I do that is with Twitter. Because I’m relatively new to Twitter, I wanted to keep a sort of log of my activities there. I was hoping that by doing this, it would make Twitter easier for me to understand and faster to ‘get up to speed’ with. While my use of IFTTT and Twitter didn’t initially work out the way I’d intended…a much more helpful and important use for IFTTT emerged. Since I began using IFTTT at the beginning of my Twitter experience…connecting the 2 has proven to be extremely valuable for me. This actually occurs once a day…which is good for keeping my Evernote account from getting filled up with single notes. In fact, the new Tweets are actually appended to an existing note which changes, or rather, begins with a new note each month. This is great because as I’ve become more proficient with Twitter I’ve not found a good way of going very far back into time…it’s a similar phenomenon in Facebook too. To go back in time in my own profile, in both cases I need to scroll and scroll…sometimes for a very long time…just to find some much older information that I can find almost instantaneously by employing an Evernote search. 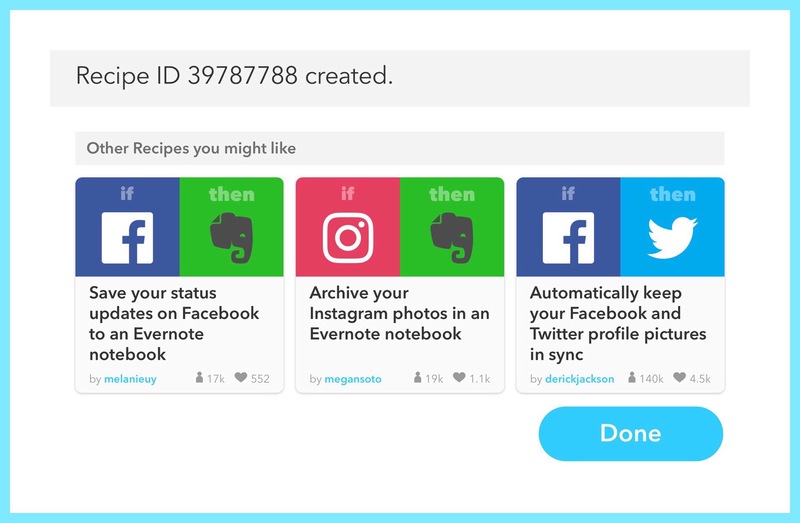 Just by visiting IFTTT’s main website, you’ll automatically be shown lots and lot’s of interesting recipes, or rather, many cool ways you can use the IFTTT service. I haven’t really explored using IFTTT’S app until today. The thing that motivated me to download and sign into the app was a new recipe I signed up for that will notify me whenever NASA’s Space Station will be immediately over my house. I discovered that just going through the steps to set this up didn’t necessarily mean that this new action was working. I decided to test out my new recipes by visiting my recipe page. 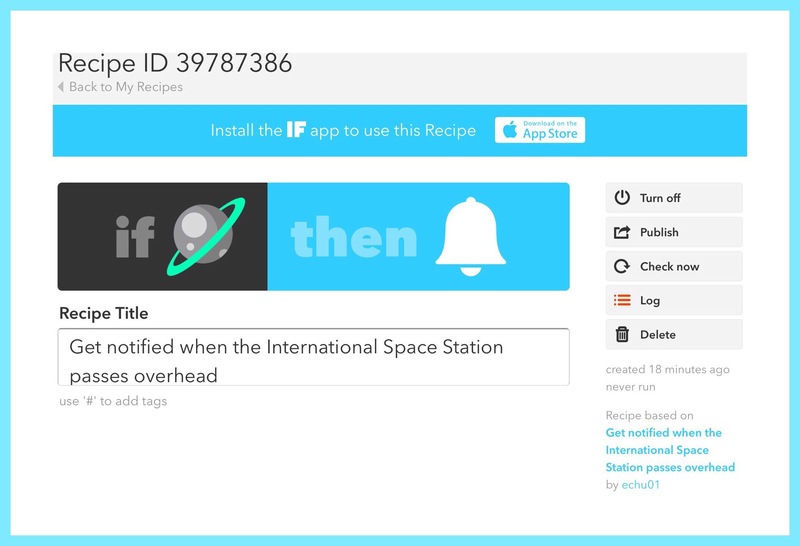 Once there, IFTTT listed all of my recipes and it let me do different things with them. One thing you can do is to test a recipe. I tested the Space Shuttle one and found it FAILED! It was hard to miss IFTTT’s warning in red! The main reason that I chose to test that specific one was because I was curious about how I would actually be notified. Would it be via an email or text message? Looking at the advanced information for the recipe didn’t shed any additional light on the matter for me…because I’m not really a coder. So I decided to download the IFTTT ios app and sign into it. Sure enough, I discovered that’s the vehicle it will use to notify me! 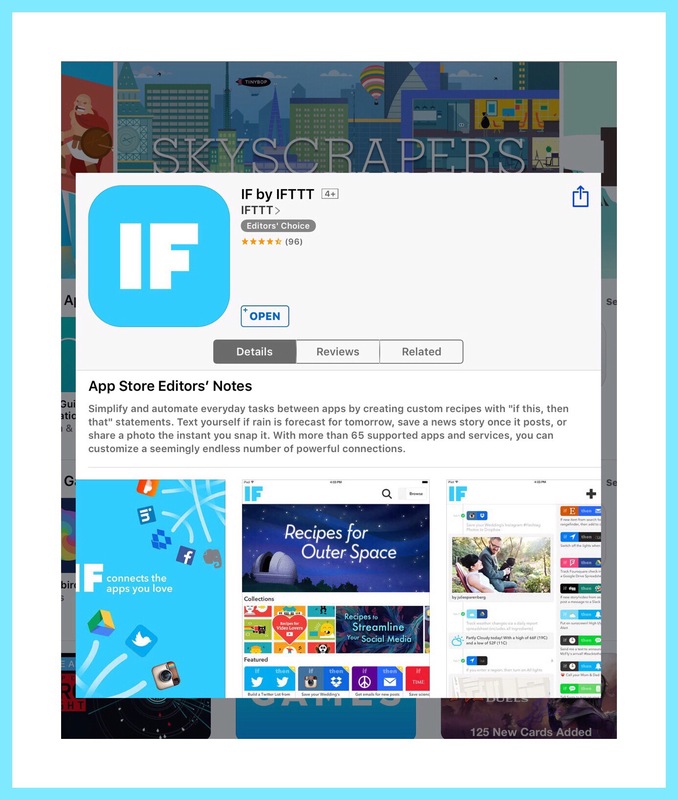 The link I provided above is for the IFTTT ios app. Here’s a link to IFTTT’s Android app too. I also discovered that it might be possible for me to use IFTTT’S app to create my own recipes…which is something I’ve really stayed away from up until now. The possibility though of being able to easily code my own IFTTT actions is pretty exciting! While I’ve only just begun to learn about all the cool ways you can automate your home and make your life simpler…it’s a topic that’s exploding on Twitter…which is a great place to keep up-to-date about IoT happenings. What Can You Do Easily With Home Automation Right Now? 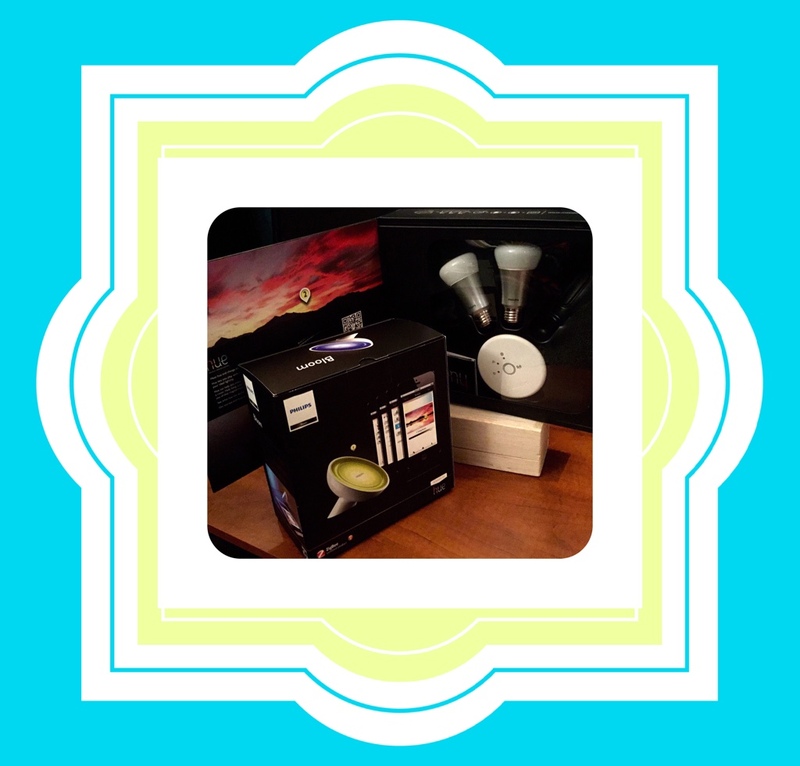 You can buy an Internet bridge and a few Phillip’s Hue, Cree, GE or LIFX light bulbs that can change colors to suit your mood or music, or go on at specific times…like maybe when you arrive home or walk into a room. The technology is quite entrenched now and PC Magazine’s article does a good job of describing the best alternatives for this. All it takes to set this up is a small bridge device made the manufacturer of the light bulb you choose and then a few light bulbs that you screw into your existing lamps or ceiling fixtures. You can take control of of home heating and cooling functions by buying a Nest or Honeywell smart thermostat and swapping it out with you existing ones. While I haven’t used Nest yet, when we had some furnace work done recently we needed a new thermostat so our heating cooling guy put in a smart one made by Honeywell. It lets me check the weather before I get dressed each day or change the settings when we go on vacation remotely if we forget as we’re racing out the door to catch a flight. What Exactly Is Amazon Echo? Well, as I mentioned above, I’m pretty new to Echo myself so I’m just testing the waters. But so far, here’s my take on the Echo. It’s a pretty cool, yet discreet device that sit’s on our bookshelf and it’s where Alexa resides. Alexa is a lot like Siri…but she’s pretty different too. I first learned of ‘her’ after I published a YouTube video about how Siri scared me sometimes by talking when I had no idea ‘she’ was even listening! I shared my new video on Facebook. 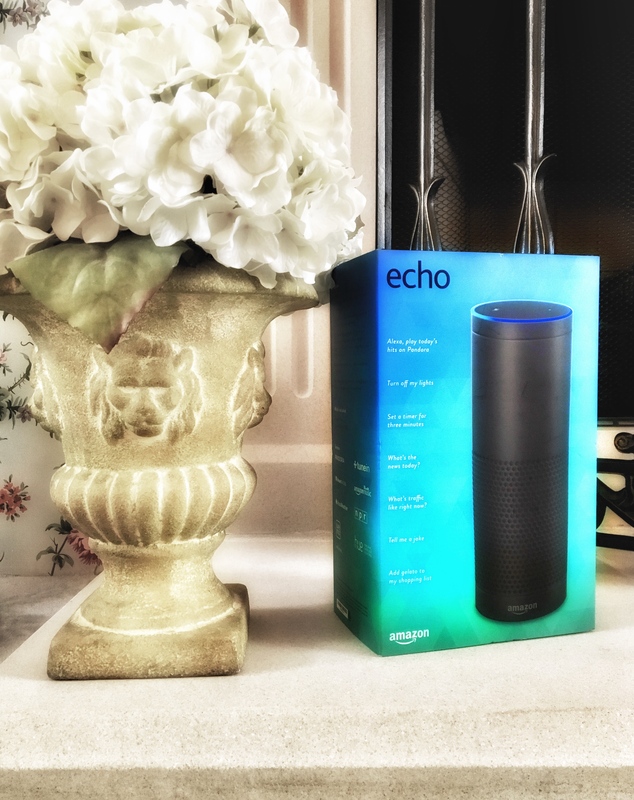 A friend commented on my post that he and his family were often startled in the same way by Alexa…which of course led me to immediately Google ‘Alexa’ and read up on the Echo…and ultimately dropping some thinly veiled hints to my husband and kids that the Echo would be a great Mother’s Day gift…and a little different from the more typical flower bouquets! keeping my shopping list of Amazon things…and really more lists but I haven’t quite sorted this out completely yet. Alexa should also be able to conduct any kind of Internet search for us…using Bing, which, as it turns out, is also the search engine that Siri’s programmed to use! I never knew that, but when I thought about it I realized that Google is Android…so probably Google isn’t motivated to let Siri and Alexa upstage OK Google searches! Sadly, our internet searches using Alexa haven’t been great so far…unless we search for one of the things she’s already been trained to search for like asking how much the earth weighs. So here’s one obvious disadvantage of being an early adopter…but according to this short Wired article, Alexa should be able to do much more! IFTTT can help you to easily automate you home using a companion service and app that the IFTTT developer’s also created called Do. There are companion apps for Do for Android and for ios. 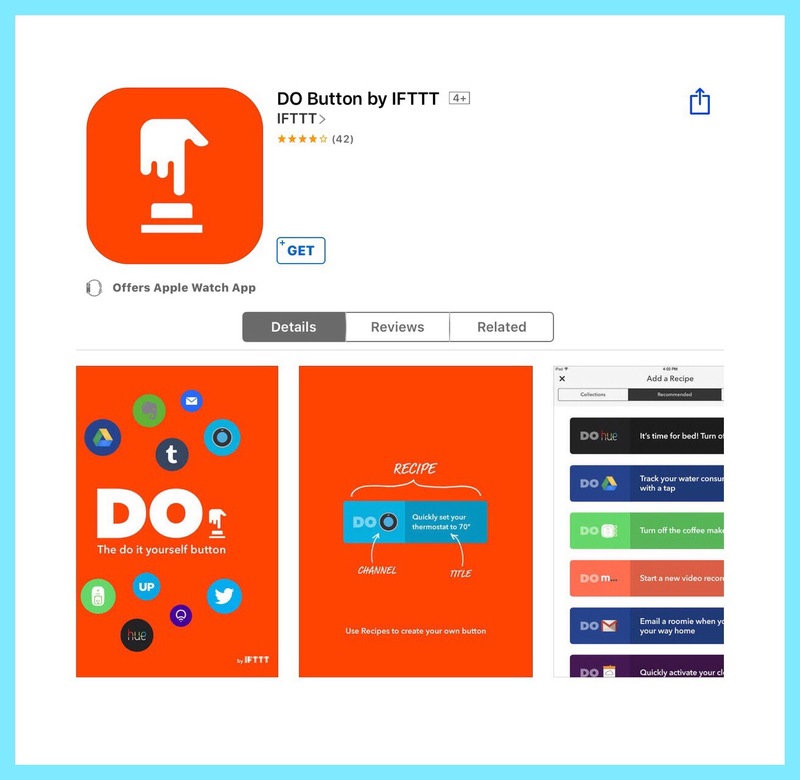 I’ve not yet used the Do service or app, so I can’t speak knowledgeably about it…but you can read a lot more about both IFTTT and Do, and how they work in Pocket Lint’s great article here. And trust me when I tell you that the little bit in which I’ve dabbled in the home automation arena so far has really ‘knocked my socks off!’ It’s an exciting subject with a huge host of already widely used applications! If you’re interested, here’s a link to a great PDF Verizon published recently that gives a good overview of IoT’s current state of affairs. Last, I’d like to share this current article about the obstacles the IoT Industry is still facing, along with some educated guesses about outcomes. This entry was posted in Evernote, Evernote Hacks, ios 9 Quick Tips, Productivity and tagged Amazon Alexa, Amazon Echo, Do by IFTTT, Easy Automation, Get the most out of Evernote, IFTTT, Simple ways to connect web services. Bookmark the permalink.